Samsung Electronics Co. plans to release the Galaxy A9 smartphone in the Indian market next week, industry sources said Thursday, seeking to catch up with its Chinese rival, Xiaomi Corp. The Galaxy A9, whose release date for South Korea has not been confirmed, is the tech giant's first mid-range smartphone to come with a whopping four cameras on the back. The device will be released in India on Wednesday. 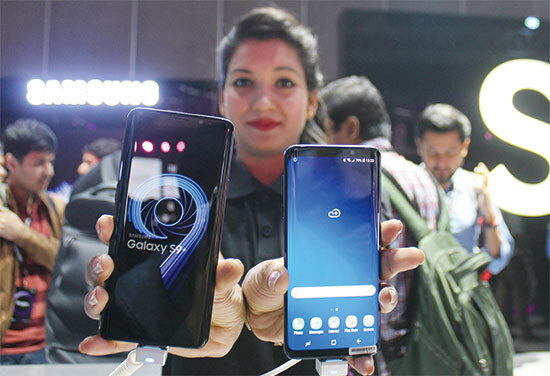 This year, Samsung Electronics released a variety of smartphones in India, including the Galaxy J series, flagship Galaxy S9 and Galaxy Note 9. In August, Samsung release the Galaxy J2 Core running on the Android Go operating system designed for entry-level devices. The company, however, currently falls behind Xiaomi in terms of market share. According to a study conducted by Counterpoint Research, Xiaomi took up 27 percent of the Indian market in the third quarter, followed by Samsung with 23 percent. China's Vivo Communication Technology trailed with 10 percent, and India's Micromax held 9 percent.